The SAS-2 is Meiji's answer to the call for a heavy-duty, cost-effective articulating industrial boom stand. 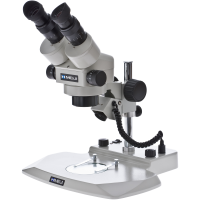 Equipped with a 20mm mounting pole and a 6" longer extension arm than the SAS-1, the stand is ideal for our EM series stereo microscopes. This heavy duty mount allows the microscope to pivot 360 degrees around the vertical axis and tilt to the horizontal position. Despite it's ease of movement and flexibility, the mount still lock the microscope securely in any orientation, even with a sizeable camera system mounted on the head. A handy friction adjustment on the tilting motion prevents unexpected movement when the lock is released. The 13" by 13" base provides excellent stability and includes rubber feet to protect the working surface and sturdy handles for convenient lifting and re-positioning as required. All in all, it's an exceptional solution for heavy duty and industrial applications requiring smooth, friction-free travel.